While he is well known in the classic jazz circuit as one of the top boogie-woogie and blues pianists around today, Carl Sonny Leyland (who is also an excellent singer) is equally skilled at playing swing and stride. In 2010 he put together a quartet to play at a wedding that included trumpeter Marc Caperone, Clint Baker on bass, and drummer Jeff Hamilton. 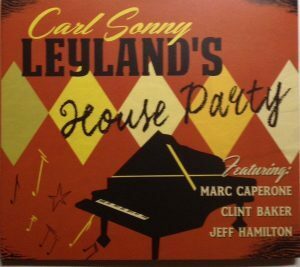 They had so much fun that a year later they recorded Carl Sonny Leyland’s House Party. However despite Leyland’s best effort to have this be a working group, the quartet could not find work which seems absolutely crazy to me! House Party is filled with stirring music that in style makes one think of a Kansas City swing session with pianist Pete Johnson and trumpeter Hot Lips Page. On a variety of blues at several tempos and high-quality standards, the musicians clearly inspired each other. No rehearsal took place beforehand, and none were needed. Whether it is two versions of “Young J.C. Boogie,” “How Deep Is The Ocean,” “On The Sunny Side Of The Street,” or the obscure “True” (which has Baker switching to clarinet and Caperone playing bass), everything works. Festival organizers, please do yourself a favor and hire this band!